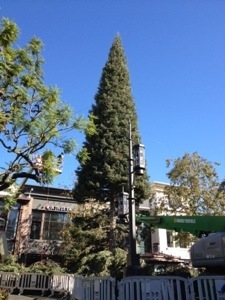 LOS ANGELES — The tree is up at The Grove as the holiday season kicks into gear. It’s not your ordinary Evergreen, the tree at the Grove comes from Mount Shasta in Northern California it is 100 feet tall and branches must be added to it. Really. The workers cut off the branches from the bottom of the tree and added them to fill out the tree, making it fuller-looking. The Grove has evolved into one of the most popular shopping places in Los Angeles. This entry was posted on November 1, 2013 by News in Balancia, Calif., California Hospitality, California Hotels, California Tourism and tagged grove, holiday, only in LA, tree.